Gone are the days when bigger necessarily meant better for startups across the country. While a billion dollar valuation meant the world to upcoming entrepreneurs as early as a year back, with the global financial tides turning, the focus has shifted from big GMV figures to driving efficiency in business models. This comes at a time when well-funded hyper-local startups like PepperTap have shut down and larger ones like Grofers and Zomato have been forced to scale down operations. The so called ‘unicorns’ are struggling to raise funds, and recklessness with investors' money is punished with tighter purse-strings. 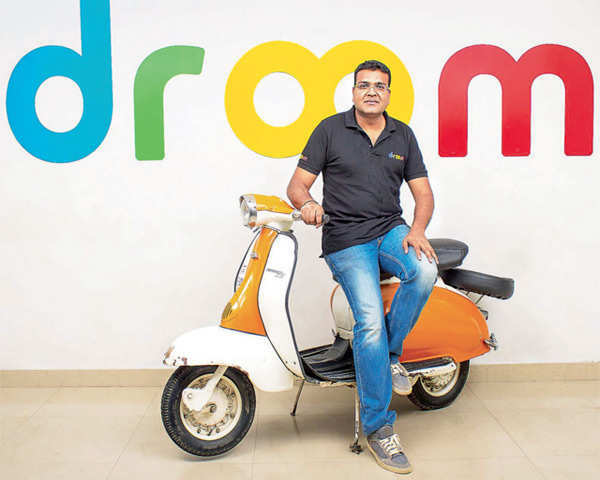 Meet Sandeep Aggarwal, co-founder of ShopClues and Droom. He was a wall-street analyst who bootstrapped his venture with his own funds and angel money that he raised from his friends and family till he first received institutional funding to the tune of $4 million in January 2012. Interestingly, Aggarwal’s latest startup Droom has a mere three employees in customer support. The company’s GMV to human resource ratio stands at $1 million annualized GMV per person. Aggarwal claims it’s the highest amongst startups in the country. His company is currently doing close to $170 million in annualized GMV. Business Insider sat down with Aggarwal to understand where machines can replace man, and where they can’t. While I’m proud of ShopClues, we still had to hire hundreds in customer support, and I didn’t want to repeat that mistake. It took me over a month to conceptualize Droom as a wireframe. I still remember, there were 127 slides. I thought through the workflow cycle, where one may need to call customer support, and what can and can’t be automated. Today we have only one supervisor and three employees in customer support. Machine learning will allow us to have similar, if not better results in customers support. I think we can touch Rs. 250 crores in GMV per customer support employee. We can improve on that with keywords-based FAQs. One can also use IVR. That’s the kind of thinking that has limited us to the services industry. It’s time we create quality product and platform companies. Human resource is cheap because it accounts for limited financial exposure, human errors and lack of reporting. Technology may deem some redundant. It’s their job to adapt and re-train themselves. That’s called survival for the fittest. That way people would actually end up earning more than they are currently. If we wouldn’t have had built ShopClues’ returns platform, over 500 people would have been doing returns alone. While from a socialist perspective you could say that employs 500 people, it drives severe inefficiencies in the supply chain. Is it a sector-specific problem? It’s all about the founder’s vision and mindset. There are three types of founders – the marketing guy, the ops guy and the product guy. You can throw money at a problem, and get it solved. Automation for the first time may have its own set of problems than deploying manual labor. Consider this, Snapdeal is only 20-30% bigger than ShopClues in terms of GMV, but has a 7-8x bigger workforce. For hyper-growth sectors, you have to train yourself to ignore certain things. However, you shouldn’t be left trying to dig the well after the fire. The best brain on earth is the human mind. There’s no substitute to that. However, in an assembly line scenario, there’s always the option to have a separate bin that can come under human inspection. Everything doesn’t boil down to a yes/no. Our technologies can also capture the scenario where there is no option but manual labor to step in. To scale quick, you have to automate certain processes. Repetitive things can actually burn human resources. Artificial Intelligence can anticipate how much information is worthy enough to process a decision. 7Nikesh Arora will leave SoftBank - what next?